Curv3s is an update for Lin3s. The main different in between this two is that Curves, does have the ability to draw Bezier curves. This means mainly more organic shapes. A few parameters have changed their names. Also the parameters has been divided into three groups Design, Effects and Printing. Hopefully this makes it more easy to use. Now if the line is closed (shift + c), the nozzle follows an spiral motion with z-axis increments per segments. This means no big z movements while printing with a closed line. 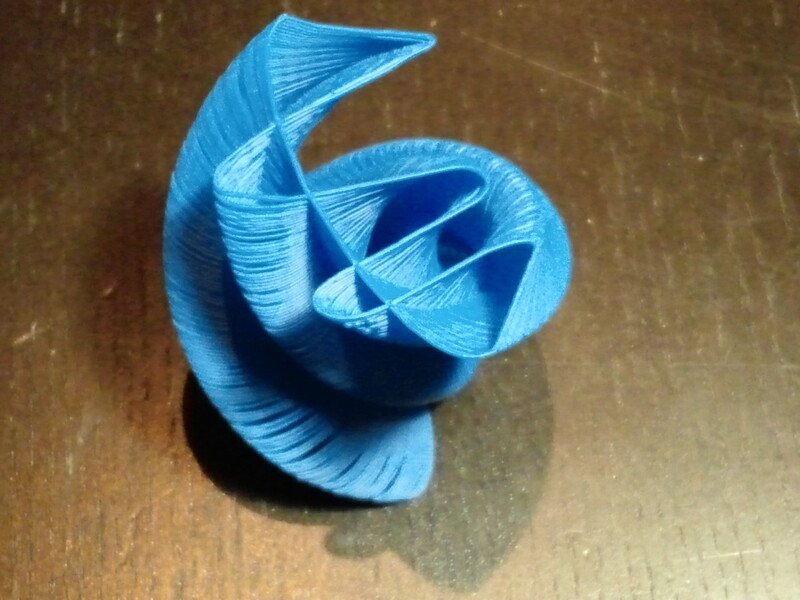 This is known as spiral vase in Slic3r. If you decide to print an open line, it will go back and forth changing printing direction on each layer(always printing). Please notice that if paste is not thick enough it is quite difficult to hold a not connected end of line. Another cool featured added is support for extruder based printers. 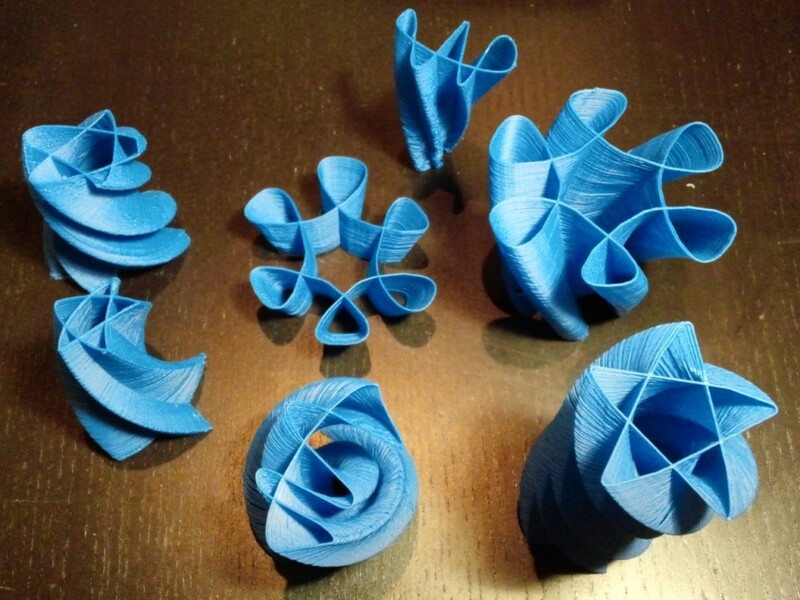 What makes Curv3s compatible with filament printers. We run some tests and it worked. But I think there is plenty of better tools for plastic, still is fun and fast. Curv3s is and experimental tool. It generates a LOT of segments for a Curvy GCode. We tried to finetune it to reduce segments without decreasing the smoothness of the path. This requires more work and experimentation . Meaning that sometimes the amount of data send to the printer is too big so the printer stutters for a while. To draw, just click on theplace where you want your new line joints to be (starts drawing the line with the second joint). If you drag your mouse after clicking you would be able to edit the bezier joint handles (paired). To move around a line joint, click on and drag it to the new position. To select a joint, click on it. To edit a bezier curve handler joint, joint needs to be previously selected. Click on and drag the handler point and modify the curve (independent handlers edition). To add a new joint to your line, click on it. To remove a line joint, hold shift and click on the line joint. To close a line, click shift + “c”. To open a line, click shift + “o”. Width (x) [mm]: This param is a size reference the maximum measurement in x axis for the figure. Height (z) [mm]: This param is the total height of the figure. Rotation [degrees]: Total rotation value in degrees between the base and the figure’s top. Scale [%]: Total scale percentage between the base and figure’s top. Layer height [mm]: Layer height. 1st layer height [mm]: Offset layer between the base and the first layer. Feedrate [mm/s]: Printing feedrate. Also for movements. Initial delay [ms]: Initial delay after turning on air compressed (M126). Center x, center y [mm]: this 2 parameters help to center the print, at whatever center position is desired. By default this parameter is set for delta printers center = 0,0. Nozzle diameter [mm]: Nozzle diameter. Material diameter[mm]: This is equivalent to filament diameter for regular printers. And would be equal to the inside diameter of a syringe based extruder. File name: Name of the file to be saved. Hopefully this new and simplified tool help us to bring easier ways to print food, and a nicer dinning experience.